When the fall season hits, it is time to start preparing your home for the winter and checking for simple repairs that you can do yourself. Doing this will help maintain your home for the coming months, making it a more comfortable and safe environment for you and your family. Here are 10 easy DIY repairs you should do on your home in the fall. If the pipes under your sink are leaking, simply purchase a new PVC p trap and a roll of teflon tape. Removing the old one is as simple as unscrewing the fastened areas and just pulling it off. When installing the new one, place teflon tape at all the joints and screw together the joints. To get the tightest fit, use a plumbing wrench to finish off the screwing. Test your job by running the water for a few minutes. If any water leaks out, either you did not use enough teflon tape or you did not screw the parts together tight enough. If your sink is leaking around the faucet area, rather than the pipes, you can solve this by replacing the faucet. Simply purchase a new faucet. The instructions for installing your faucet will come in the package. Each can be slightly different. You may also need caulking materials or teflon tape. Check the instructions that come with your faucet. Much like in the kitchen, leaks need to also be addressed in the bathroom. Repairing a leak in a bathroom sin is fairly similar to replacing one in a kitchen. Toilets can also leak. Usually it is due to the ball valve kit located under the back cover. These are about 10 bucks each at a home improvement store. All you need is the kit. It is easy to install and comes with instructions. To clean the dishwasher, first start by pulling out all the racks and attachments. Now check all the drains and soap containers for debris. Pull any of that out. Sometimes little pieces of food or glass can get stuck in those, so watch for the glass. Once that is done, check all the rubber sealing and be sure it is all secured properly. If not, adhesive rubber strips can be purchased at home improvement stores. Application is as simple as sticking the strips in the proper spot. The adhesive on these can be strong, so be sure you have it in the proper place before pressing it to the surface. Part of maintenance also includes cleaning. For this, you'll need vinegar, concentrated lemon juice, baking soda, and a sponge or dishcloth. Sprinkle baking soda along the bottom of the dishwasher. Fill a spray bottle halfway with vinegar, 2 tablespoons of lemon juice, and the rest with water. Spray down the inside of the dishwasher, including the bottom, where the baking soda is. The baking soda will bubble. This is fine. That pulls up dirt and grease. Now starting at the bottom, scrub the entire inside of the dishwasher, including the door. Do not rinse away the solution. Replace the racks and fill all soap and other liquid dispensers with the lemon juice and vinegar mixture. Close them and run a normal cycle with a hot rinse and heated drying cycle. Check the weather stripping on the interior, as well as the exterior of your home. Replace any worn or peeling areas. Damaged or improperly placed weather stripping can cause cool air to come inside the home, as well as let heat escape. Weather stripping can be purchased at hardware and home improvement stores. There is stripping with adhesive or that which has to be nailed down. Apply according to which type you choose. Be sure the stripping is applied securely to the surface so that it does its job effectively. Check interior and exterior doors and windows for cracks. Use caulking to seal any detected problem areas. To caulk a crack around a door or window, simply squeeze a line of caulking along the exposed area and swipe it with a caulking sponge to press the sealant in further, as well as to create a smooth finish. Don't forget to also purchase a caulking gun when you buy the caulk. Without one, the caulking is not as easy to apply. A caulking gun can be as low as a few dollars. Some homes can have exterior drains leading to the basement. Be sure to clear away any brush, leaves, dirt, or other debris from the drain openings. Vinegar is a great natural substance that cuts through tough-to-remove dirt and other substances. Simply spray it on from a water bottle, let it sit for a moments, clear away the debris, and wipe the surface clean with a cloth. As for the inside of the drain, run a plumbing snake or auger through the drain. If it is a short drain, a wire coat hanger can sometimes be substituted for the snake or auger if you don't have access to either. Just pull the coat hanger in and out of the drain. The fall season is a great time to shut off the access to any outside water. Doing so can prevent the freezing of the outdoor pipes around hoses and other outdoor water valves. Also, when you do this, unfasten any hoses or other devices attached to outside water valves. These should be stored away until spring. This is a good step for more than just the fall season, but be sure you check to see that all of your detection devices are working properly. Most some detectors and carbon monoxide detectors have a test button. Press that button on each to see if they work properly. With increased usage of space heaters, fireplaces, and other heating devices during the fall season, it is important that your family will have working alert devices, should a fire or natural gas problem occur. During the fall, leaves, pine-cones, and other falling debris can get clogged in your gutters. Clogged gutters can lead to poor drainage. To clean out your gutters, simply scoop out the debris that has collected. A garden trowel works well for this. Once that is done, spray the gutters out with a garden hose or pressure washer. If you are using a garden hose, attaching a high pressure spray nozzle will make this easier. If any of the tubular gutters are clogged, use a plumbing snake or auger to unclog them. It is important to be sure your thermostat and heaters are working before he weather starts to get cooler. First, test them by simply turning them on and being sure that the heat is coming out at the right temperature. If there is no heat coming from portable heaters, they should be replaced. If there is no heat coming from the furnace, you will need to test the thermostat. To do this, first turn off your furnace. Then, return to your thermostat box and remove the cover. Remove the wires from the panel by unscrewing them from it. Take the red and white wire and wrap them together. Tape the wires you won't use to something, such as the wall, while you are working. You don't want to lose them inside the wall. Turn the the furnace back on. If the furnace blows and its burner ignites, then your thermostat is bad. If this doesn't happen, you may actually have a problem with the wires, not the thermostat. Check to make sure the wires run all the way to the furnace. Pumpkins, scarecrows, black cats, and cornucopias...what do all those symbolize? Fall. But, not early fall. All of those are for later on in the season. Fresh fall flowers are a great item to decorate an early fall party table with, as they're so versatile. Here are several ideas. Which Fall Flowers Should I Choose? Some favorite fall flowers include marigolds, chrysanthemums, hydrangeas, and fall roses. Annuals can also make great fall flowers, if they are the right colors. Fall colors are generally shades of red, gold, brown, green, and yellow. One way to decorate with fall flowers is to add a vase of freshly cut fall flowers to the table in a fall-themed container. If you opt for a more plain container, but want to dress it up, try gluing a strip of fall-colored ribbon around the rim and base. To finish it off, place some grapes around the base of the container. Another way to use fall flowers as early fall party decorations is to use just the heads of the flowers. One way to do this is to place a container of water on the table and allow the fall flower heads to float atop the water. For more accent, add floating candles and maybe some pine-cones or acorns as well. 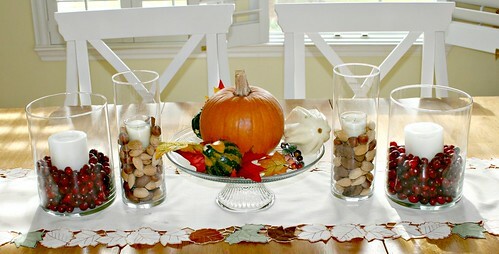 Fall flower heads can also be sprinkled around the table. Fall flowers, pine-cones, and acorns can be used together to create fresh fall table wreaths. Simply intertwine the flower stems with one another to create the rings. Then, add the pine cones and acorns using ribbon. The ribbon will also be a part of the wreath table decorations. To use these wreaths, place decorative containers or candles in the center of them. Small table wreaths can also be made to encircle the glasses of the guests. Another fall table decoration could be a garland. The goal is to create a long string of flowers, pine-cones, and acorns. The strand should be long enough that when made into a circle (or applicable table shape), it fits exactly around your table. This is done in the same manner as the wreaths above. Creating fall party table decorations from fresh flowers can be a fun activity and as you can see from above, it is fairly simple, with easy to obtain supplies. A fall garden party can be a great way to welcome and celebrate the fall season. The fall garden party activities below are a great way to keep your guests talking and leave them something to remember long after the party has ended. What's a fall garden party without planting seeds? Ask your guests to bring fall seeds to exchange with others. They can either buy seeds from the store, bring seeds they have but won't use, or cultivate some seeds from their own gardens to share. If there are loose fall seeds, place those in zippered sandwich bags to make it easier to distribute them. Once everyone has contributed their share, sort them in a way that makes it easy for everyone to choose which ones they'd like. Have a designated area to organize all the seedlings and also figure out how many packages each person will be able to have.You may wish to supply something fun for each person to collect their seeds with, such as a watering can or small pot or planter. Another fun garden party activity is DIY container planting. Your fellow gardening pals will enjoy this activity. It can be fun to garden together with friends. Tips can be shared and since guests at a fall garden party will likely be gardeners, most should be enjoying themselves. Supply ﻿gloves﻿, a container, fall seedlings, soil, and a garden spade. You may also want to have guests use some of the seeds acquired during the seed swap. Allow guests to bring home whatever they have planted in their planters. This not only gives the guests something fun to do at the outdoor party, but it also gives them something they can use. Plus, each time they look at their fall plants, they can remember the great time spent with their friends. If you'd rather gear your fall party toward being charitable to others, instead of the DIY container planting, guests can create buckets for the homeless. Buckets for the homeless are actual container gardens using buckets. For these, you'll need a large bucket for each one to be made, soil, and vegetable seeds or sprouts. Buckets make great container gardens for the hungry or homeless because they can be easily carried around. They provide a continuous source of nutrition that they can bring anywhere without worrying about refrigeration. Be sure to plant a variety of vegetables. Usually for these, the tomato is planted in the middle, with other vegetables surrounding it. Place a cracked egg underneath the tomato plant for extra fertilizer. Also, be sure that holes are poked in the bottom and sides of the buckets for irrigation. When entertaining guests for a fall party, paying attention to the table decor and settings can be a great way to show your guests you care. Table settings for fall entertaining should be appropriate to the season, as well as interesting and unique. The ideas below could help you set the mood to entertain your guests in a fun and festive new way. Part of a nice fall table setting includes having interesting napkin rings. Instead of plain napkin rings, try re-purposing other items that are the right size to create unique napkin rings. Who says napkin rings have to actually be rings? Try other shapes. For instance, heart-shaped mini grapevine wreaths work very well. For even more effect, tie on some raffia or attach some silk floral stems. Speaking of floral stems, they can make great napkin rings by themselves. Take a silk flower bud and insert a 3-inch piece of covered floral wire inside with some craft glue. Once that dries, create a circle by twisting the dangling wire to the top part that is right outside the flower bud. Fall placemats for table settings can be made from fabric or other materials. To accent fabric placemats, attach a fall silk flower bud to each of the corners or all the way around the edge. 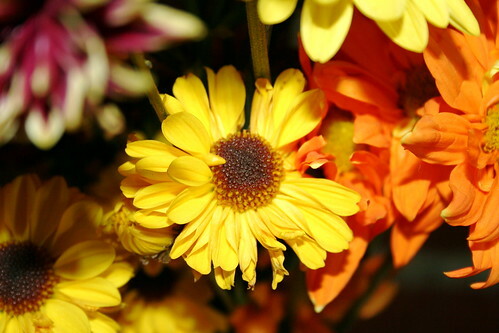 Sunflowers, marigolds, and daisies are common fall flowers. Bamboo placemats are also great to go along with other fall table settings. Fall dinnerware can be in traditional fall colors, such as yellow, red, and orange. Other colors to consider are gold and purple. These two colors go well with the other fall colors, but if you are going for a more elegant fall look, these will help. Layering different-sized plates is one way to add layers of color. To draw attention to the items low down on the table, make the largest plate on the bottom the one with the most design or color. To draw attention to taller items, save the patterned or colorful design for the bowl that is placed atop the layer of plates. Candle holders can be made from many different things and can be a simple way to brighten up a fall table for entertaining. One simple way to create a fall candle ring is to gather some sticks from outdoors and a piece of twine. Cut or break the sticks into pieces about 3 inches long. Place them around each candle in a circle. Tie the twine around the center of the sticks to secure them. The same thing can be achieved with bamboo sticks, raffia, and even fresh flowers. Goblets make great drinkware for fall table settings. Golden colors enhance the effect. To accent them further, put decorations around the bottom, just as with the candles above. Interesting drinkware can be a great conversation piece when entertaining guests. Sometimes drinkware can be found in interesting fall colors and shapes or have designs on them, such as 3d grape shapes. The season has quickly changed from summer to fall and it's time to start decorating accordingly. Flowers are easy to incorporate into any theme and can be used in a variety of interesting ways. There is no limit to the decorating possibilities with seasonal fall flowers. Here are five fun ways to decorate with seasonal fall flowers. ﻿Seasonal fall flowers﻿ can be used to create strands that can be hung around door frames. This can be done with both silk and fresh flowers. When using fresh flowers, be sure to dry them first and spray them with a floral acrylic coating to protect them. Sunflowers are great for decorating door frames, as they accommodate the large space. Because of the yellow color, they also can brighten a room. These, of course can be used to make great table arrangements, but there are more ways to use them on the table as well. Flower garlands can be wrapped around the table legs. Also try sprinkling flower buds and stems around the tabletop. Marigolds and daisies in varied colors are great for this. Fresh or silk can be used. Seasonal fall flowers can be put in a simple vase on the countertop. Also try laying out a flower garland and winding it around existing countertop decor. Just as on the table, another fun way to decorate with seasonal fall flowers is by sprinkling them around the countertop. Be sure you do this in a designated are, of course. You still need some counter space for other things. Seasonal fall flowers are fun to use in various places around the house. Try wrapping seasonal fall flower garlands around assorted pieces of furniture. Lamp posts and chair legs are great spots for this. Also experiment with wrapping them around the edges of tables and stands. Yellow fall flowers are great for rooms that need brightening. 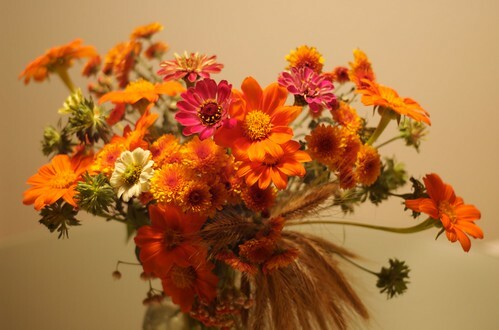 Orange fall flowers can balance an extra bright room. Choose red for a more romantic feel. Seasonal fall flowers can be used on the wall in all sorts of fun ways. Create swags and hang them in various places. It can also be fun to wind flower garlands around wall sconces, picture frames, and other wall decor. Try letting seasonal fall garland strands cascade over other decor for a natural look. This can be especially fun to do in between picture frames and other grouped wall decor. Don't be afraid to experiment.